1 ton Harrington hoist with motorized trolley and nylon energy chain package. 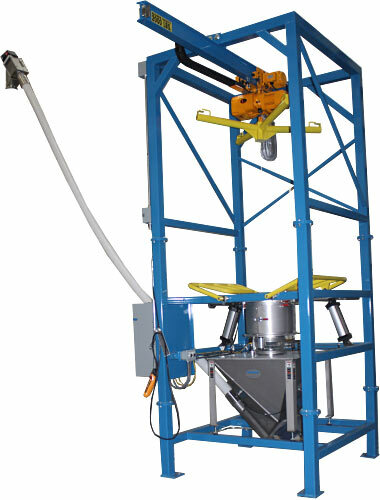 Exclusive Spider-Lift™ bulk bag lifting frame. Sure-Seal™ system clamps bag discharge spout for dust-tight product discharge. Flo-Master™ bag massaging system with tubular frames break up clumps, and promote material flow. Unit includes the exclusive Flo-Lock™ slide gate for partial bag discharging. 304 stainless steel product discharge transition with flexible hose. System includes a flexible helix conveyor with VFD controls, a 304 stainless steel inlet hopper, and a 184″ discharge height. Screw conveyor inlet hopper features a motorized material agitator, and fluidizing pads. Inlet hopper also includes a quick release end cap for auger removal and cleaning. Proximity material sensor with a stack light, audible alarm and yellow flashing light to indicate empty bulk bag condition.